Table For Three, Please. » Cafe Uno…at Long Last! You know how people raaave about the latest hit movie, and when you finally get to see it, you think it was just…OK? I kind of felt that way about Restaurant Uno. Maybe I just had such high expectations after people kept telling me it was awesome. Added to that was the fact that it took me three years before I could finally try it–on each of the four previous occasions I visited, it was closed! (Just so you know, it’s closed on Sundays. And, based on experience, some random weeknights. Or maybe they just close really early?) Thus, as you could imagine, this was an eagerly anticipated visit. Don’t get me wrong, I didn’t hate the place. I just didn’t understand why it inspired such breathy praises from friends (“Oooh, Cafe Uno! I loooove that place!”). B got the Sizzling Chicken Tikka Masala with Dried Mango Chutney (P340). It looked incredibly appetizing, and the chicken was really tasty–terrific, considering a lot of restos serve flavor-less white meat with deceptively tasty outer layers. 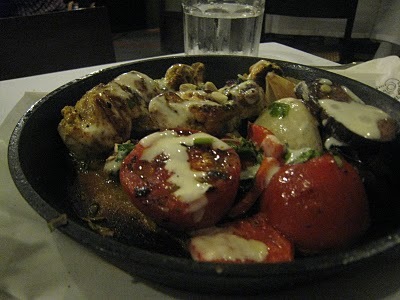 There were also grilled veggies (and a fruit) on the sizzling plate as well–tomatoes, onions, peppers, eggplant. B’s comment: “Parang high-end na Mr. Kabab.” Yes, it was good, but I think you could get the same thing (or something close to it) elsewhere for cheaper. 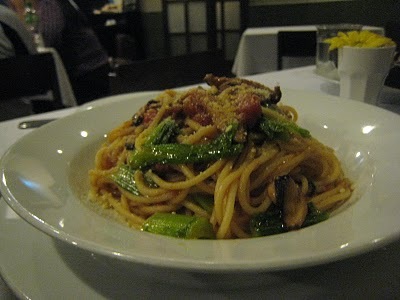 Since I seem to recall friends mentioning that the pasta’s good, I decided to take the adventurous route and order me the their Shitake and Mustard Leaf one on spaghetti noodles (P195). 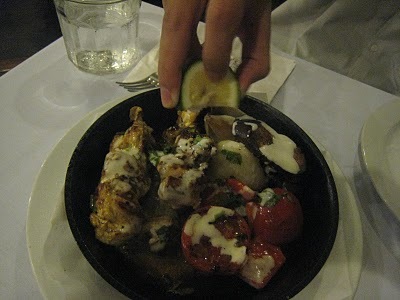 This was served with an olive-oil-and-tomato sauce. The verdict? Pretty average, and not worth the price tag. Was Restaurant Uno worth the three years’ wait? Honestly, not so much. I’m also a bit confused about what kind of cuisine they specialize in: They had pasta, and they had Indian-inspired entrees. Hmmm. Perhaps I just caught them at a bad time–I hear they change their menu every so often. I normally don’t like giving restaurants I didn’t totally enjoy another chance–there are so many other restos and too little time. But in Cafe Uno’s case, I’m willing to make an exception. I have to affirm that my friends have good taste. Honestly, Uno can be such a hit or miss place depending on when you go. But for me, the bread alone is enough reason to visit. Hi Gina, thank you for validating my experience! Haha. I now don't feel quite as compelled to go back and prove my friends right! I agree. Uno was just... okay.